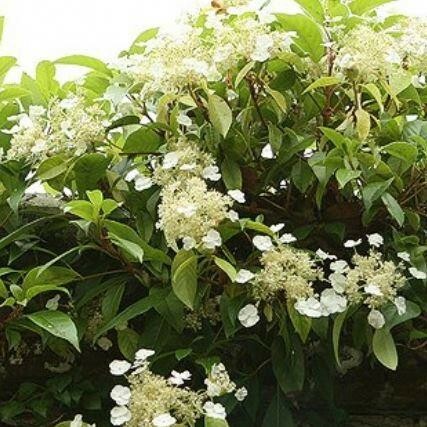 An evergreen climber with large, serrated, dark green leaves which are leathery, glossy and large. Creamy-white, flat flowerheads in summer which emerge from distinctive round buds. Hydrangea seemanii is an unusual evergreen climber that provides interest throughout the year and which looks lovely when in flower. The greenish white flowers erupt from large buds to wonderful effect. Ideal for clothing a large wall or garage, the plant is actually native to Mexico. If left unpruned, it will eventually reach a height and spread of 10 metres. Supplied in approx 2-3 litre containers.